“I was in constant pain – in my joints, back, and headaches. I had very low energy, trouble sleeping, depression symptoms, and sinus issues. My joints are no longer in pain. I am feeling well enough to start racing 5k’s again and plan to race again in triathlons next season. My headaches are gone. I no longer have headaches or sinus problems. In fact, now my sinuses are clear! I can hear better for the first time in years. I am sleeping better, my energy level is up, and my depression has lifted. “I was definitely not feeling well and it was a number of things contributing to this. First of all, my eyes with severe dryness and severe blurred vision. Second, extreme tiredness and foggy thinking along with irritability and tension. It was tough for me to handle stress at all. My knee was swelling and painful along with my ankle swelling. Vast headaches frequently and occasional ring in the ears. Oh, and one more, severe dry cracked skin – fingers, heels, toes, elbows with itchiness. Extreme sweet cravings along with emotional eating. “My 10 year old daughter, who is doing the program, was tired all the time. She was also grumpy, irritable, and angry much of the time. She started fights with her sister constantly and was causing a lot of dissension in the family. Every day was a struggle for all of us. “Randi has helped my family with many of our health needs. But two instances really stick out in my mind. My son was suffering from a mild case of turrets, his pediatrician wanted to put him on medication for it. We were not comfortable with his suggestion, so we took him to see Randi. She found he was suffering from an immune challenge and suggested some changes to his diet and a few supplements. It took a few months, but his symptoms disappeared and now he is a normal little boy without any uncontrollable ticks. Again, Randi came to the rescue when I lost sight in my left eye. It began with a headache and blurry vision and after a misdiagnosis from the ER, a visit to a specialist and over 1000.00 later, Randi was able to get me out of pain and get my sight back. It took several supplements and a strict diet to get me back to normal but over the next month, I felt more and more like myself every day. “I first met Randi a few years ago when we both were enrolled in the Nutritional Therapy Association’s Nutritional Therapist program. She was cool, but super smart, and one look told me she knew a lot more than the rest of us! I got to know Randi for two reasons. First, she was a classmate, and I was paired with her to practice our clinical skills. The first thing that came to mind when trying to describe her clinical skills is, she blew me away! From her muscle testing skills to her knowledge of the human body, and nutritional supplements, I knew this lady had so much more skill than the rest of us. She came at things with a different perspective based on all that experience. After all, she had taken classes from some of the great healers in the holistic world, and it showed. Now, I’m no fly by night myself. With over 20 years in critical care and emergency medicine, I had some skills myself, but Randi impressed even me! The second way I got to know Randi is because of my back injury. I had previously fractured my spine, and lengthy trips in the car tended to flare this old injury. Not to worry though, because someone in class said, ‘you have to meet Randi.’ So, I crawled up onto the massage table, ready to be her willing patient. By the end of our session, I was in tears and I was embarrassed to be so, as I hardly knew this person, but she make me feel comfortable none the less. But by the end of that night, I had minimal pain- not an easy feat. She had somehow gotten that old injury to become a submissive memory. I was able to finish the rest of our training weekend with not only a happier spine, but as a happier person. After a few painful experiences with fellow students who hadn’t quite mastered the “art of touch” I sought Randi out because I knew she was an experienced LMT and also she had a calming yet vibrant energy about her that I was immediately drawn to. Randi was so gentle and kind that I trusted her with some potentially painful body work having to do with releasing the webs of scar tissue on my abdomen that was causing problems in my hip. She helped me immensely. Throughout our school year together, I realized how knowledgeable Randi already was about nutrition and how nutritional deficiencies contribute to all sorts of bodily dysfunction. She has gone out of her way, literally traveling around the country, to deepen her knowledge by training under some of our country’s most esteemed healers. “I met Randi a number of years ago when I was looking for an amazing massage therapist that could help me release the pain and tension in my muscles. What I ended up finding was an all-round guide to better health. Randi has helped me find the correct balance of nutrition and supplements. I have been diagnosed by my doctor with Hashimotos (a thyroid disease) for more than ten years. In that time I have seen my weight and energy go up and down. With Randi’s help, I’ve been able to add in the supplements I need in order for my medication to be as effective as possible. With Randi’s help, I was able to restart and kick start my thyroid into thinking it was healthy again. I will never be off medication, but I need to have a guide who understands the changes in my body before I do. I need someone who possesses the knowledge of what can help to keep me healthy and strong. I love what she has done for me and I know that if I need anything, she is only a phone call away. “I was a singer for many years. That was until I became very ill. I had strep throat and an upper respiratory infection that I left untreated for too long. The result left me with scarring on my vocal cords and a very raspy voice. The worst part was I wasn’t able to sing as much as before. After a singing only a couple of songs my voice would become very horse. I would have a sore throat for days. I was so frustrated that I had given up on singing completely. I thought the issues with my voice was a result of being sick. That was until I met Randi. I went to visit Idaho to present a life coach seminar at her facility. After the seminar, Randi offered her services to me. She introduced me to muscle testing and was able to single out issues with my body down to the specific organ system. It was astonishing! Randi discovered that my body was over taken by yeast and was able to pin point that exact timing of when the yeast was introduced into my system. It was causing my migraines and was effecting my vocal cords! I couldn’t believe what she was saying. More importantly, I had never shared my story about my inability to sing any longer with her; therefore, I was floored when she made the discovery. “Randi Kirchofner gave me back my life. I came to her in pain, on multiple medications and terrified that I would never feel good again. I had been to multiple doctors and was given multiple prescriptions, but nobody could tell me why I felt so bad. The medication didn’t help. I couldn’t eat without pain. My hair was falling out by the handful and I was so tired all the time that I felt like I had been drugged. My brain was foggy and my memory was getting worse and worse. The constant depression that I felt was overwhelming. I had lost all hope. Randi didn’t just see me as a collection of symptoms. She saw me as a whole person. She taught me how to listen to my body and realize that my symptoms were my body’s way of asking me for help. Rather than trying to shut my body up with medication, she taught me to listen to my body and give it what it needed to function the right way. She taught me to add what was missing and remove what was causing my body stress. Within a couple of weeks of working with Randi I was able to eat without pain for the first time in over a year. Within a few months I was off all medications, including the antidepressants that I had been on for over twenty years (under the guidance of my medical doctor). My mind is clear and my body feels amazing! I have more energy than I have ever had and I love my life! 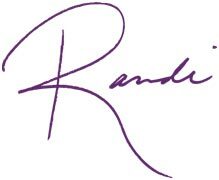 Randi made it easy, interesting and fun to learn how to take care of my body the right way. She not only helped me balance and heal my body, but she taught me the necessary skills to maintain my newfound health and energy. Randi changed my life in more ways than one. Not only did she help my body to heal, but she instilled in me a passion for health and a desire to teach others. She inspired me to follow in her footsteps and last year I became certified as a Nutritional Therapy Practitioner. I have started my own nutritional therapy practice where I can share the invaluable information that saved my life. My mission is to do for others what Randi did for me.